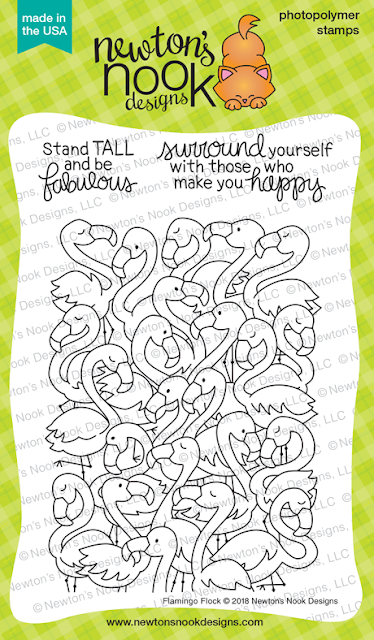 It's Day 3 of Newton's Nook Designs 5 Year Celebration and I'm so happy to have you join me today! We have 2 new stamp sets to share with you that join the family of giant stamp sets including Woof Pack and Company of Cats. First up we have Flamingo Flock! 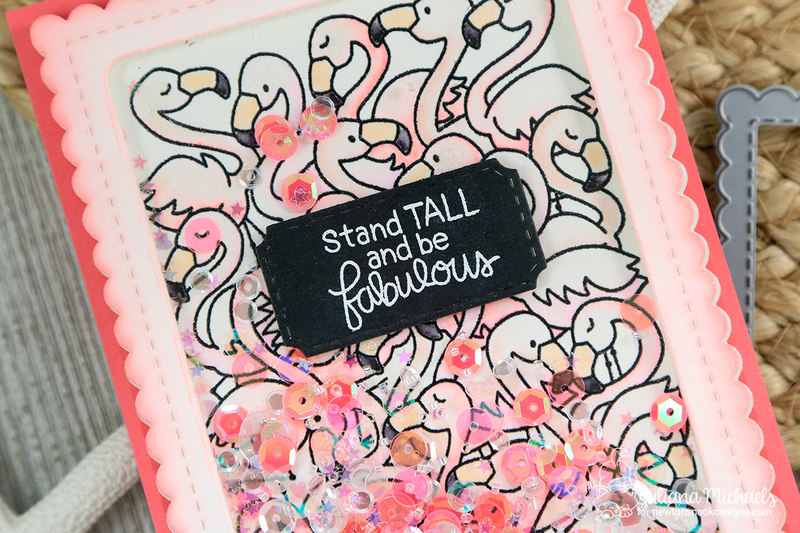 If one flamingo is fun, then you know a whole flock of them is bound to be fabulous! 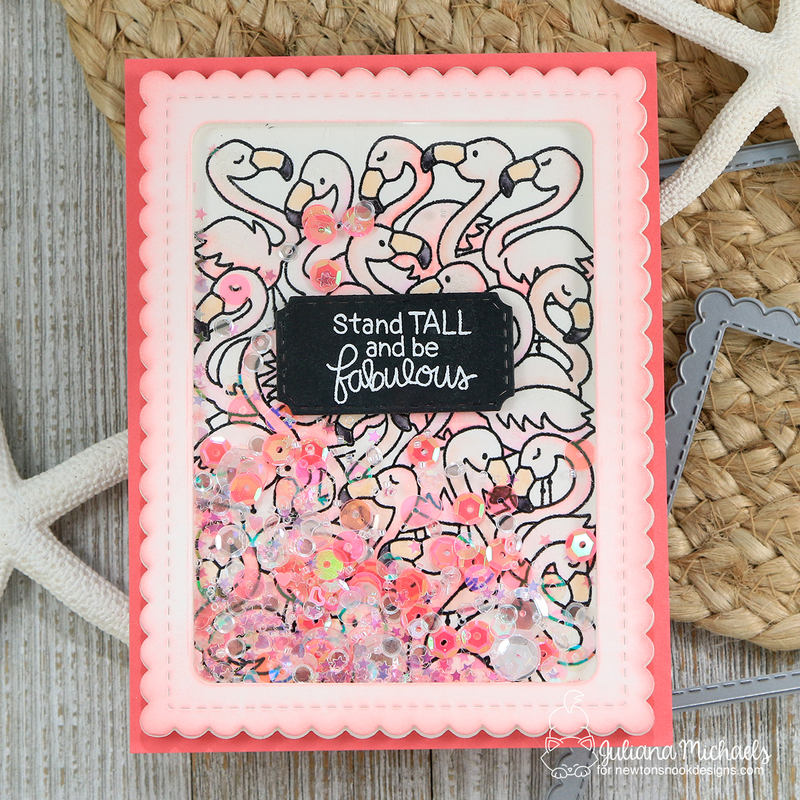 For this card and the second one I'm sharing today, I created a shaker card using Newton's Nook Designs Double Sided Foam Adhesive and Acetate Sheets. I began by stamping the Flamingo Flock image onto watercolor paper with Black Versafine Ink. I then heat embossed it with clear embossing powder. Next, I colored in the flamingos using Zig Clean Color Real Brush Markers and a water brush. Once all of the coloring was completed, I die cut the piece using the large scallop edged die from the Frames & Flags Die Set. For the sentiment piece, I die cut a piece of black cardstock using the ticket die from the Framework Die Set. I then stamped the sentiment with Versamark Embossing Ink and heat set it with white embossing powder. Finally, I adhered it with double sided foam tape to the center of the image. To create the shaker part, I used Therm O Web Purple Tape to hold together the large scallop edged die and the stitched rectangle die from the Frames & Flags Die Set. I then die cut a piece of white cardstock and a piece of the Double Sided Foam Adhesive with this to create the shaker window. Next, I trimmed a piece of Acetate to size and adhered it to the top of the foam piece. For a touch of color, I inked the edges of the die cut scallop piece with Distress Oxide in Worn Lipstick. I then adhered this piece on top of the acetate. I then poured some sequins and beads on top of the stamped Flamingo image making sure to keep them to the center of the piece. Next, I adhered the shaker frame on top of the stamped image. I then finished off the card by adhered the shaker piece to a piece of coordinating cardstock. 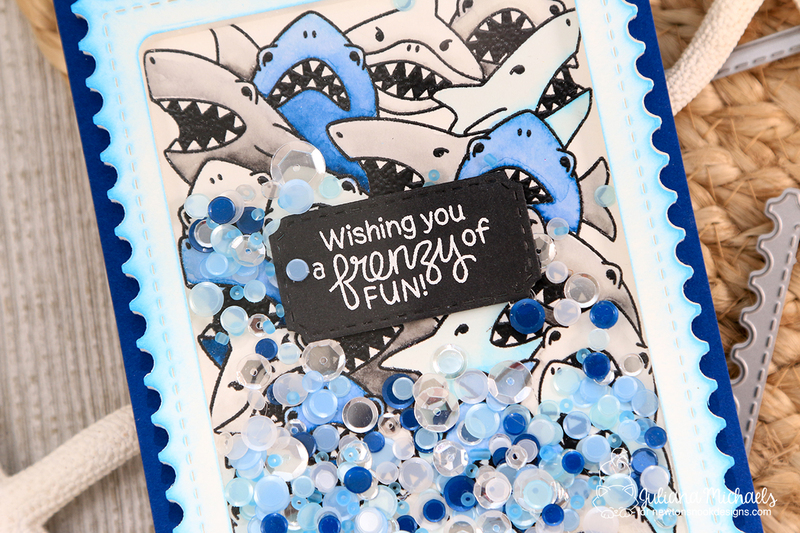 As I mentioned, I also created a shaker card with the Shark Frenzy Stamp Set as well. The main difference here, besides the stamp set, is that I used the large postage edged die from the Framework Die Set to create the shaker box. For the coloring, I again used the Zig Clean Color Real Brush Markers. I find these to be a quick way to add color to such a large image. As you can see, I went with a blue and gray color theme to fit with the shark image. I carried the color theme through on the sequins, jewels, ink and cardstock. Here is a full view of all of the new stamp sets being revealed today. They each have a coordinating die set to go along with them. So....now to the fun stuff! Would you like to win a $20 store credit to Newton’s Nook Designs? If you want to win, all you have to do is comment on the Newton's Nook Designs blog and each of the Design Team blogs! Make sure to check out each of their blogs and comment for your chance to win. The winner will be chosen at random from the collective reveal posts. You will not know which blog has been chosen so the more you comment on the better your chances are of winning! You have until Thursday July 19th at 9pm EST to comment -- winners will be announced on the blog post on Friday, July 20th. Great shaker cards. Both are so cute. Great idea to make shakers of the cards. Love, love, love shakers! These are awesome. Love the monotone color scheme of each. Love both shaker cards. So creative. I love both of these, but the shark card is so awesome. I love it a lot. wonderful shaker card...love the sentiments in this set. Love your shaker cards and these stamps are so great! SUCH COOL SHAKER CARDS! really great job! AMAZING shaker cards! Such BEAUTIFUL colors for each card! And the different colored sequin mixes is absolutely GORGEOUS!! These new background stamps are awesome! These are both just darling! Love that they are shaker cards! Your cards are so fun and lovely!!!! Love these beautiful & colorful shaker cards! So fun! Cool pair of shaker cards!! Loving those sentiments!! These images are perfect as shaker cards! Beautiful designs and execution. Wow! Awesome shaker cards!!! Stunning colouring!!! Your shaker cards are so cute! Great colors. Your cards are awesome ! I love shaker cards, never have enough of them.... and they make everyone happy ! Beautiful shaker cards! 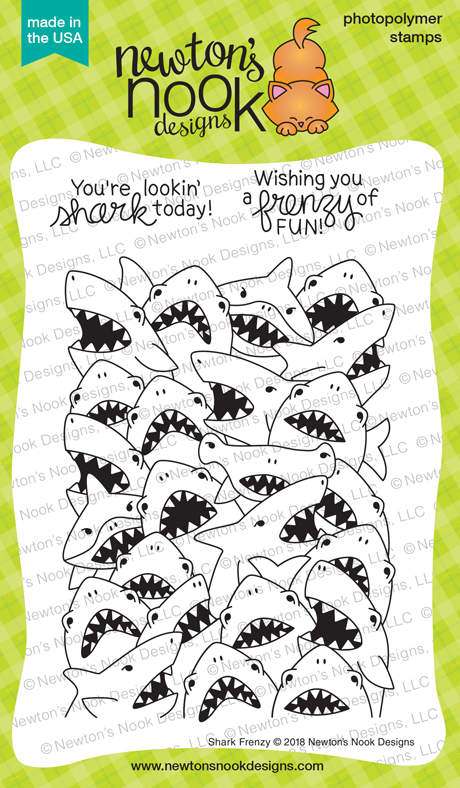 Those sharks are awesome! I'm really enjoying this release! Happy 5 years to Newton's Nook! Super cute cards! Love that they're shakers - such a great way to use those stamps! These are two very fun shaker cards ! !